It's an entire week of Christmas listings for this recap -- starting with a bunch of these vintage Ideals Christmas magazines from the 1940s-1960s. The Santa illustration on the right is the work of German artist George Hinke. Each edition has lots of fun vintage photos and illustrations. Four antique German ornaments with sprigs of tinsel inside (the pinks have sold). More antique ornaments -- silvery pine cones. These ornaments are WWII era -- they have paper caps due to the metal shortage. A few more assorted indents and stripes. These ornaments are Victorian era foil "icicles". A pair of angels, made in Italy, that aren't really ornaments, although they were used as such by their former owners. And glittery boots, probably made in Japan. 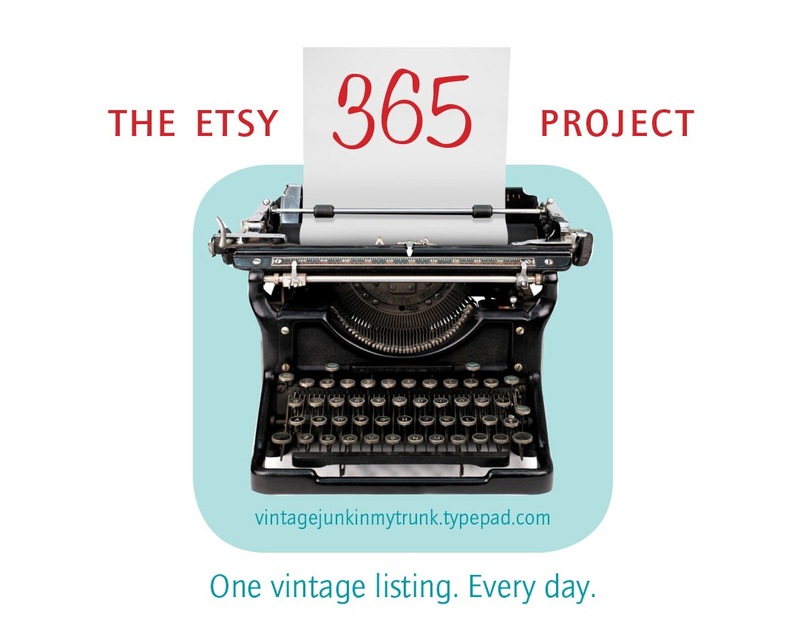 I hope you like vintage Christmas, because this Etsy 90 Project 2014 recap is full of it! …and a fabulous vintage rhinestone jewelry Christmas tree art. I did manage to add a few non-Christmas items in my other shop, like this framed print with fabric and rickrack trim. And this cool camera -- I never even knew there were "Girl Scout" versions! Most of these listings are from our Bouckville, NY adventure, which I have yet to show you in detail. I guess you'll just see it all in my Etsy shop first! Really, I've been much, much better at keeping current on my Facebook page, and now, on Instagram. Although I'm going to try extra hard this month to keep things up-to-date on my blog too. Here's the original packaging for some tree light clips. And a box of angel hair spun glass. This is about 14 feet of antique German tinsel garland. Adorable felt dog in stocking. Much better than an elf! Or this creepy Santa, who is just an oversized, albeit jolly, old elf. This Xmas Tree Lighting Outfit by Propp is a precursor to Noma lights, and has fetched big bucks on ebay. I'm hoping I didn't make a mistake listing it on Etsy instead. I don't like ebay. Started pulling out my pile of miniature feather tree ornament boxes. This one has cute graphics and pretty colored balls. 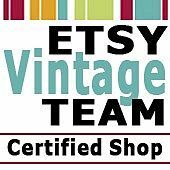 So even though I'm listing one item a day, that's not nearly enough to get through this hoard of Christmas and other vintage items. So I'm going to list AT LEAST one item a day, hopefully in each shop. In my listing links, "O" will stand for Original (shop) and "X" will stand for Christmas (shop). If there is more than one listing for each shop, it will be represented as A/B/C/etc. Into my regular shop, I listed this gorgeous antique brown transferware Staffordshire tureen. I cannot believe it doesn't have a chip on it, especially since I found it buried under a bunch of other stuff. This one too, although it's not as old. Finally, these Merry Mushroom ceramic canisters from Sears. They are not my usual fare, but I was seeing them all over Instagram, and when I found them at a yard sale I felt I had to get them. Plus the proceeds were being raised to send autistic children on a field trip, so win/win!